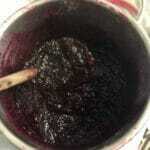 Rosella jam is made from fresh Hibiscus flowers. These flowers are also called Rosella flowers, Roselle flowers, Agua de Jamaica (Latin countries), and there are many other names it goes by. 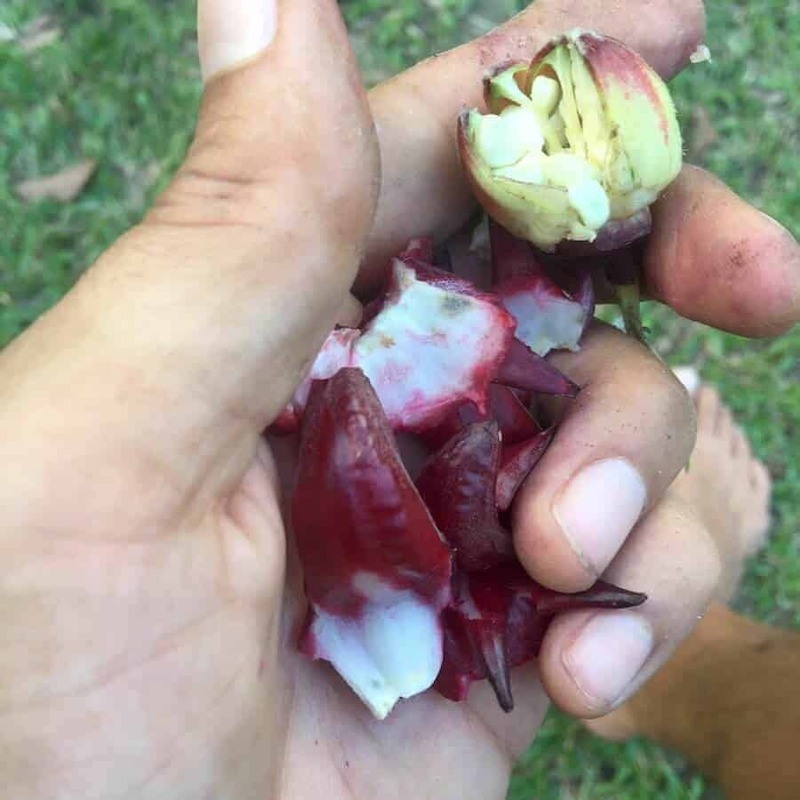 There are a few different species of the Hibiscus flower, but for the most part, this flower is known for its deep red color and unique tart yet palatable taste. With a touch of honey or organic palm sugar, plus some salt, the final result on this jam is something I find myself going back to the fridge for to sneak in spoonfuls. 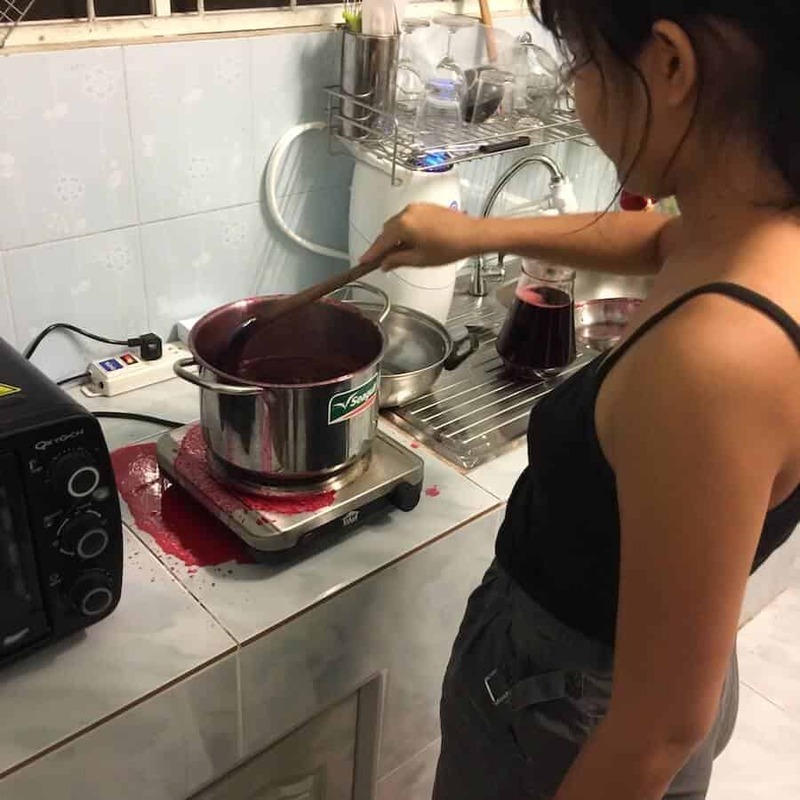 I love Rosella jam because of its unique taste and because of the fact that it doesn’t spike your blood glucose levels when you get a little overzealous with the spoonfuls. Here’s how it’s made..
I’ll start off with the picking of the flowers. Here’s what the flowers look like when they’re fully budded and ready to pluck or harvest. I believe harvest is the correct terminology, but I like to say pick or pluck. Harvest sounds like one’s trying to hard to be a proper farmer. Pluck works just fine. Rosella plant is a very tall plant. It’s a hearty perennial that’s easy to grow if it’s in the proper environment. It loves the sun and grows taller the more sun it has. We have a bunch of random Hibiscus plants sprouting up so this leads me to believe the seeds cultivate easily from bird poop. Here’s the Roselle flowers, freshly harvested from the trees. First you have to peel the flowers. 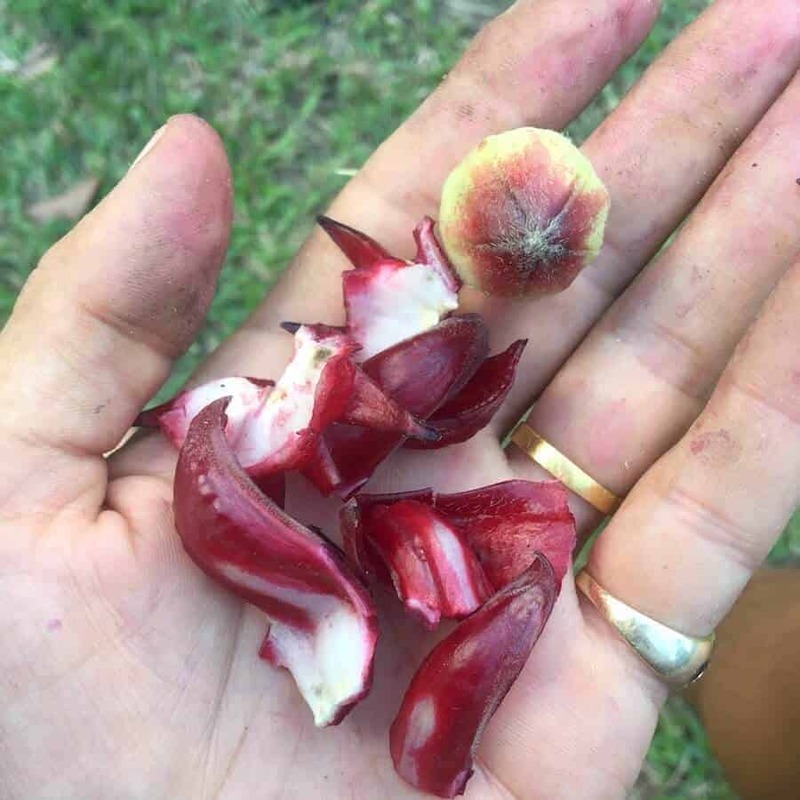 In the middle of the Rosella flower is an acorn looking ball that houses many smaller seeds inside.. 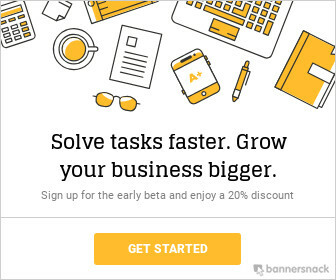 This white ball thing is what you want to toss, save or do whatever you like with. Here are the seeds inside it. I didn’t realize how dirty my hands were when taking the pic, but they were washed before making the Rosella Jam so no worries there! 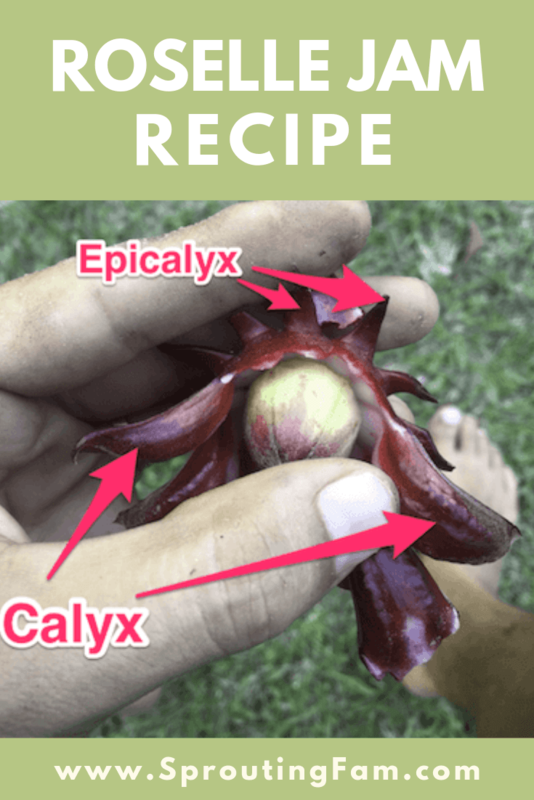 So step 1 is to peel all the petals off your Roselle flowers. 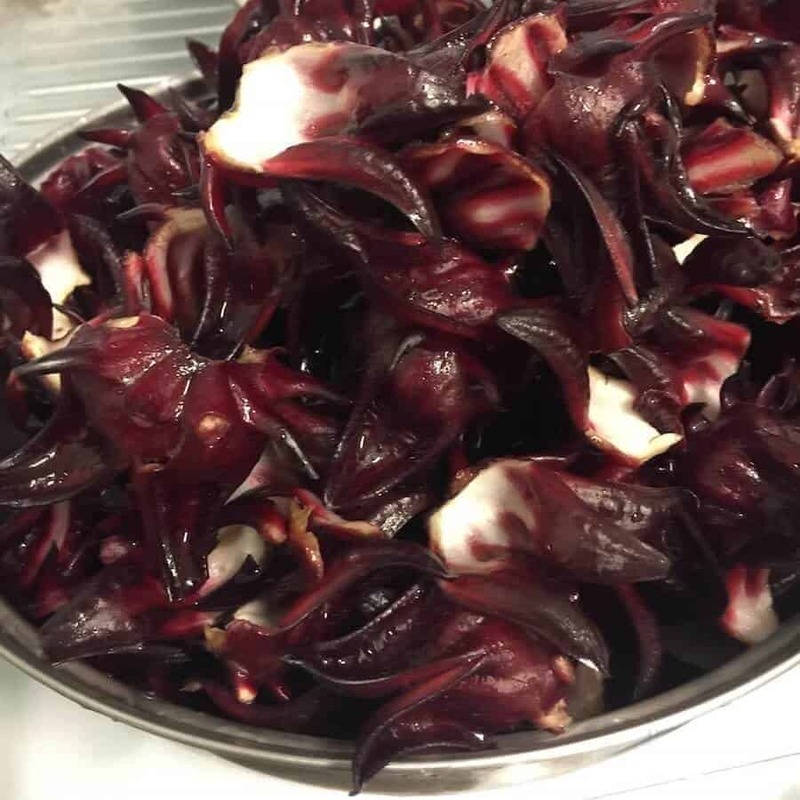 What you’ll end up with is a large bowl of Roselle flower petals. They are thick and spiky. I haven’t tried eating them raw, and I’m not sure if it’s suggested, but that though just came to mind as I sit here typing this out. 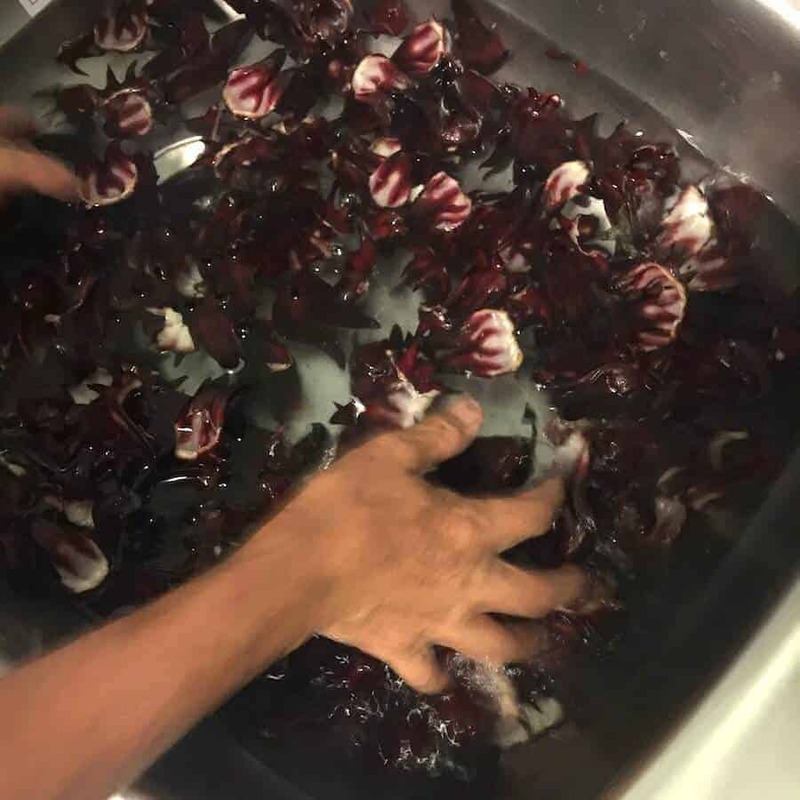 You need to wash the Hibiscus flower petals before cooking. It’s recommended to do a triple wash to be safe. What I do is fill up the sink with water and then drop in some iodine and baking soda. These flowers we grew ourselves and are 100% organic, but you never know. We live in farming country, and one of our neighbors I know uses pesticides sometimes, so there could potentially be some carry over in the air or from water run off even though our farm is very far away. I play it safe even though my guess would be there is nothing carried over from the neighbors who are fairly far away. We just used a basic pot and filled it over halfway with drinking water. 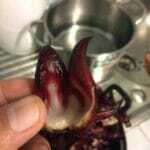 Once it starts boiling, add in the Roselle flower petals. My mother-in-law says to add salt to taste once you add in the flowers. The sweetener is not added in until it’s almost ready, but the salt is added in now at the beginning. Keep the boil going over medium heat, while constantly stirring. If the heat is on the upper end of medium, regardless of whether you’re covering the pot or not, the roselle flowers tend to stick to the bottom. If you have it covered, and you stop stirring, then it will rise up your pot and overflow/explode. I didn’t get a picture of the explosion, but you can see some of it from the pics in this post or in the video. Stir until the juice is almost gone. 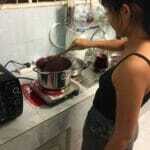 Once its condensed into a jam like substance, it’s ready. But before it’s fully condensed, you can add the sweetener of your choice. Let it cool down, and at this point you can add more honey or sugar to taste. My mother in law unloads a whole bag of brown sugar in it to make it taste really, really good. But it has wayyyyy too much sugar. I prefer to add some honey or sugar bit by bit because although it’s great super sweet, it’s also just as good without being over sweetened. The salt balances out the tartness and it’s almost perfect as is with just salt. However, to make it even more addicting, you can add some sweetness. Honey blends with it perfectly. You can’t taste the honey, and it doesn’t affect the original Hibiscus flower flavor at all. For this reason, I think honey is the best sweetener for this Rosella Jam. However, fresh stevia leaves would also make a great sweetener. 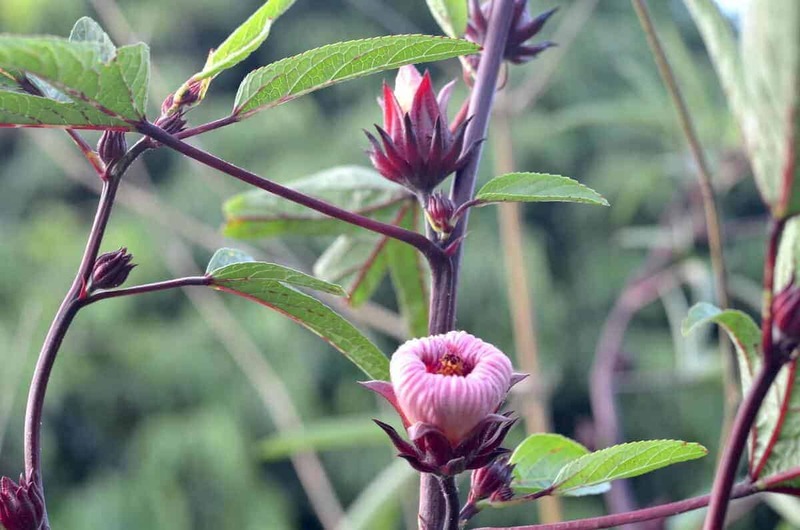 I’d use the extracts with caution, but if you have some fresh or dried stevia leaves, you can boil them in water and use that ‘stevia tea’ to sweeten the Roselle flower jam. This will just make it slightly less carb loaded. Hibiscus tea is full of really great health benefits. I will have to make a whole new post about its health benefits because there are literally almost 100 that some cultures have used this “superfood” for since centuries back. 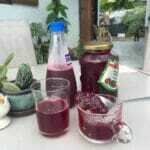 Here's how to make a Roselle jam with freshly plucked Hibiscus flowers. It's very easy to make. It just requires a bit of time to wash, peel, boil and stir. Altogether it's right around 1 to 2 hours max, to completion. Stir over medium heat a bit longer if needed, until it's no longer liquid-y. This is the same process that makes Rosella tea from fresh flowers. 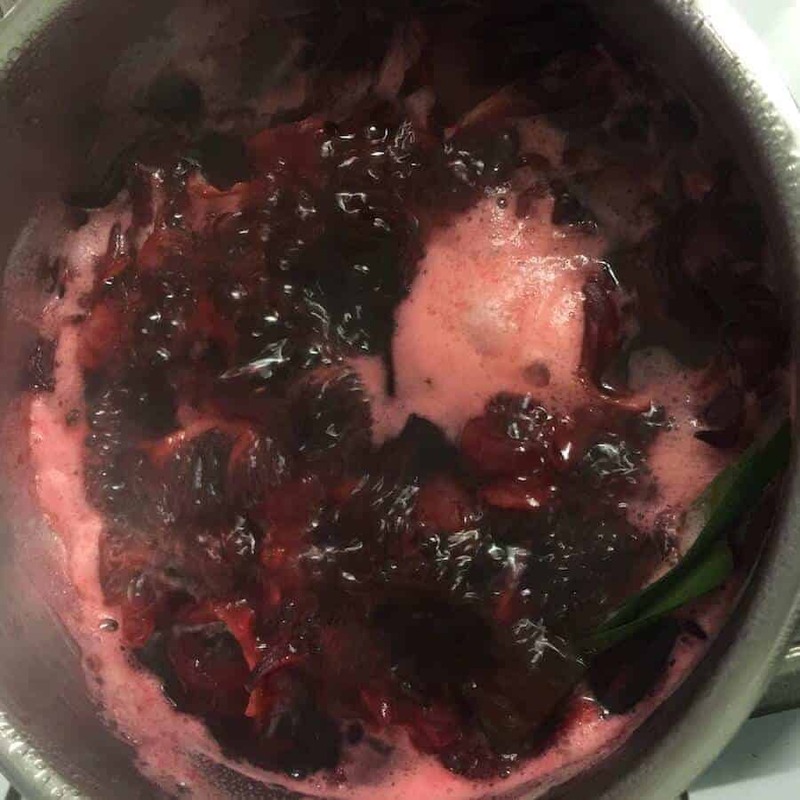 After the first boil, remove the top half of water and that will be your Hibiscus tea. 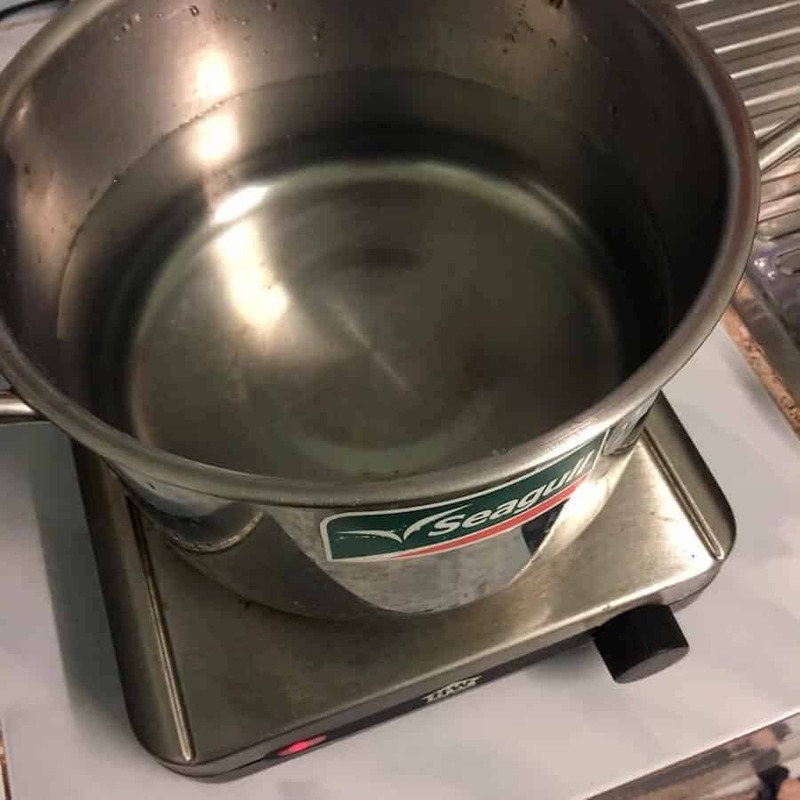 If you're making a tea at the same time, just add a couple more cups of water at the beginning. Then the remainder left in the pot gets boiled into the jam. Here’s a great link that shows you the nutrition facts for Hibiscus. 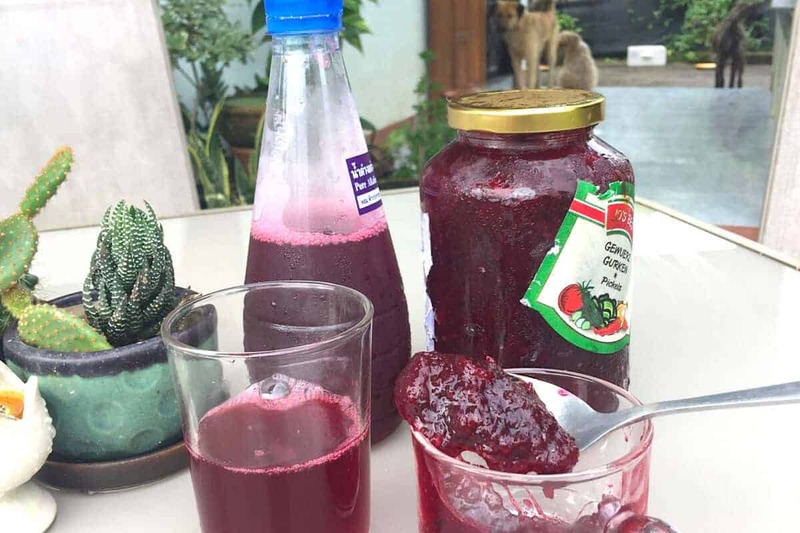 The nutritional information is for Hibiscus tea – but you can translate that for the jam. The jam will have more carbs since you actually eat the flowers, but the rest is the same other than the amounts of salt and type of sweetener you decide to use. 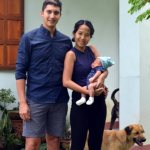 Related Read: This is the first recipe post up on the blog, but I plan on adding more as we make them here at the house. To follow along you can subscribe to our newsletter where I will alert you of each new recipe published, or you can bookmark our recipe page and come back in the future. 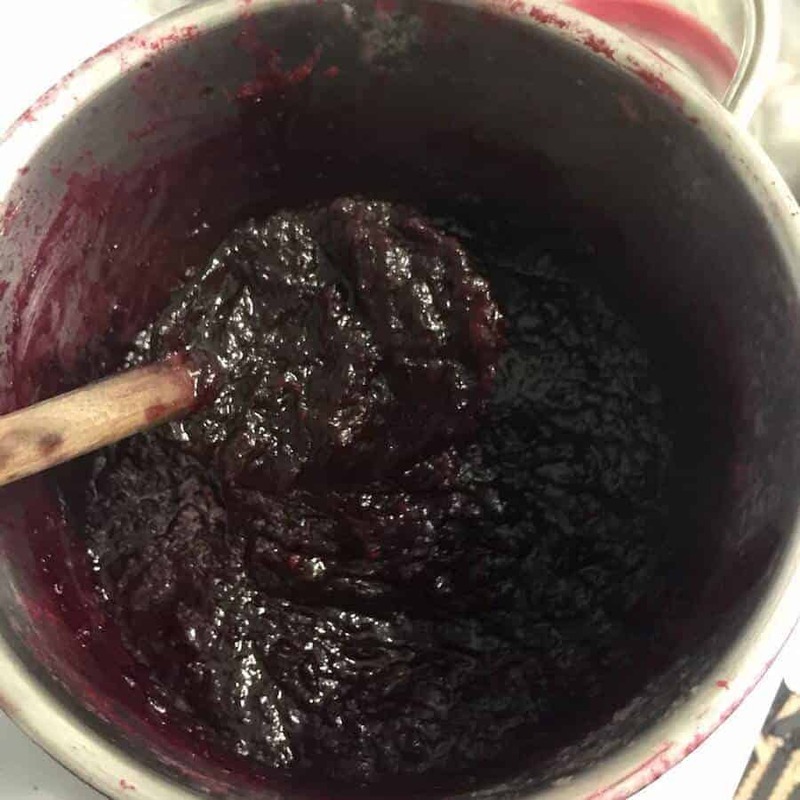 Let us know if you made Rosella Jam!